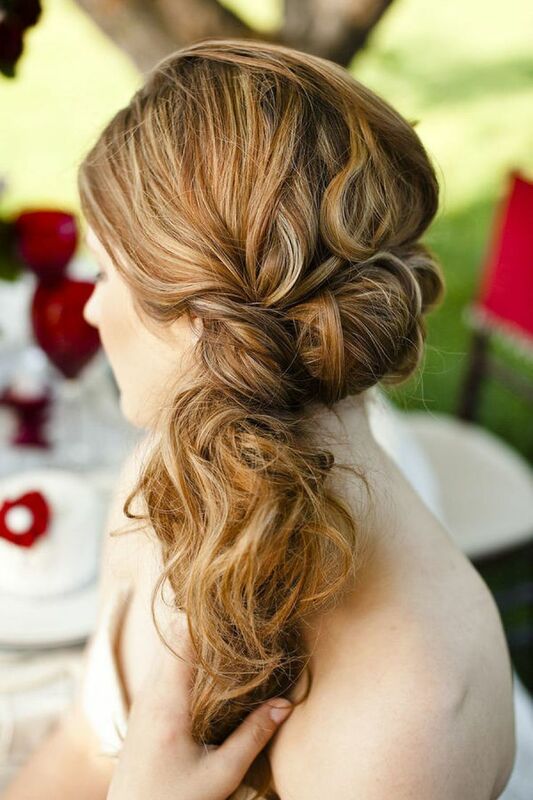 Take a look at 20 beautiful and stylish hairstyles to wear at a wedding. Try them out for a fabulous look this wedding season! No matter whether you are the bride or a friend of the bride, you always want to look your absolute best. One of the key components to creating a look that is remembered and loved is your hair. Your crowning glory will either take your look to new heights or make it sink. No need to worry, we have brought you 20 stylish wedding hairstyles that will suit your hair and your style. Leaving your hair loose may seem like a very basic style, but if done well it can work wonders. Especially for those of you out there with curly hair, styled loose curls are a great option. Go for a wild look with thick curls cascading down your back. Add a little hairspray here and there to keep your look intact and iron out the hair close to your face. You could also choose to go vintage and get your hair styled in elaborate glossy curls. To get this look exactly right, work on the texture of your hair and enhance its sheen. If this seems a little too sober for your style, just go to work with a curling iron. Set your hair in adorably perfect ringlets that work for a day or a night wedding. Buns or ‘updos’ are all the rage this season. If your look requires an elegant yet practical solution for your hair, an updo is the best option. There are a whole lot of styles out there which you can choose from depending upon your hair type. If you have straight hair and are scared your bun may fall flat, don’t worry! All you need is some thorough backcombing and maybe a little braiding to add some fullness. Choosing a style that is messy, will do wonders for girls with thinner hair. The messiness adds an appearance of fullness. Throw in a few well chosen accessories and you’re ready. For curly haired girls, there are updo options that will keep the wildness of your curls intact while making you appear presentable in front of your relatives. When it comes to updos there’s a lot to be said about accessories. Picking the right accessory and using it in the right way can really change its appeal. Something as simple as sparkly U pins are a great investment this wedding season. Place them randomly in your bun for an effortlessly delicious look. If you are at a loss about what to use, just go for fresh flowers! Orchids, lilies or even tiny little rose buds can be used as accessories. The trick is to choose wisely and not go overboard. You don’t want a garden in your hair, all you need is one fresh flower (which can be kept fresh by refrigerating) that matches your dress. What if you want to leave your hair loose and keep it out of your face? Just pull back your hair in a gorgeous knot and style the ends of your hair. Leave the rest of it open, or sweep it to one side of your head. A side swept hairstyle is best if your blouse of choice has a deep back or is backless. For a high neck or back, letting your hair fall simply is the best option as it enhances the symmetry. Keep the front of your hair ironed or pinned or it can get disarrayed during the stress of the wedding. Choosing a braid for the front of your head will add an interesting effect. Finish up with a sparkly little jewel or brooch for your knot. There’s something really practical about braids, don’t you think? Before you get shocked, I don’t mean the braids the 60’s heroines used to wear. The latest ones are super classy and look absolutely fabulous. For a girl with very voluminous hair, a braid is one of the best options! Choose one that looks irregular and slightly messy. Try wearing it to one side of your hair, very loosely (held together by your best friend, hair spray). Let a few tendrils loose around your face for the benefit of the wind and accessorize with huge earrings. Remember, to try out hairstyle options when you go for a makeup trial. Your hair is just as important. Ask your stylist important questions like whether or not your hair needs to be washed on the day of the styling. Seems basic, but you will be surprised! If you need it, go for a deep conditioning treatment a week or so before the date, but avoid coloring or otherwise chemically treating your hair.